Fourteen-man Slaughtneil suffered All-Ireland Club Football Final heartbreak as Dr Crokes edged a 1-9 to 1-7 victory in a dour Croke Park battle. Padraig Cassidy's goal put Slaughtneil ahead but his sending off in first-half injury-time was a key moment after he lashed out at Kieran O'Leary. His retaliation, after being fouled, left Slaughtneil on the back foot. Dr Crokes played keep ball late on as their goalscorer Colm Cooper completed his set of major football medals. Slaughtneil had been aiming to add to the club's All-Ireland camogie triumph two weeks ago in a season which also saw their hurlers lifting the Ulster title. The Emmet's players were also aiming to atone for their 2015 All-Ireland final defeat by Galway side Corofin. Even before Cassidy's dismissal, Slaughtneil were struggling to get their key man Chrissy McKaigue on the ball but the sending off made that a virtually impossible task in the second half. With Gavin White operating as the spare man, Dr Crokes largely dictate the second half with the Derry champions struggling to break through the Kerry club's defensive shield when they did venture into the Killarney team's territory. Shortly after the resumption, the Ulster champions did have a penalty appeal after Meehaul McGrath ended up on the turf but referee Maurice Deegan looked to have made the right call in waving play on. 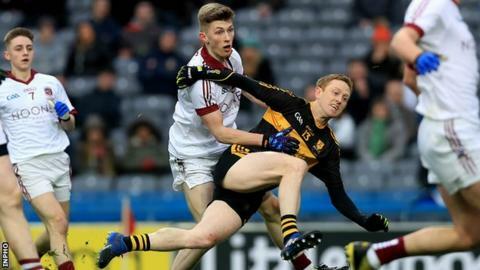 Gaelic football purists will have been uneasy with the finale to the game as the Crokes, basketball-style, held on to the ball for close to four minutes to run down the clock. Cassidy's dismissal made that an obvious tactic and there was little a tired Slaughtneil outfit could do about it. The Slaughtneil goalscorer could have few complaints about his red card as he appeared to catch O'Leary with a strike to the groin area - after a barge on the Crokes player by Patsy Bradley had led to the Kerryman being pushed against Cassidy. Cassidy had been arguably Slaughtneil's best player in the opening period which made his dismissal even more keenly felt by the Ulster champions. Slaughtneil full-back Brendan Rogers' upfield charges were a feature of the first half as he was involved in his team's opening three scores - including Cassidy's 13th-minute goal. Cassidy showed great composure to round Crokes keeper Shane Murphy and score after running from halfway following Rogers' initial burst. However, Cooper's goal levelled proceedings seven minutes later after Daithi Casey had run through the centre of Slaughtneil's defence. In fairness, Slaughtneil had been warned a few minutes earlier when White missed a pointblank chance after charging unchallenged from halfway. The half ended in the worst possible fashion for the Derry champions as two quickfire Brian Looney points were followed by Cassidy's dismissal, as the Kerry side led 1-6 to 1-5 at the break. Paul Bradley's free got Slaughtneil on terms eight minutes after the restart but as scores began to dry up, points from young substitutes Micheal Burns and Jordan Kelly helped Dr Crokes take a three-point lead which proved enough to land the Kerry outfit's second title, after their 1992 success. Burns' 46th-minute score was a morale-sapper for Slaughtneil after McKaigue had hit two wides from difficult positions as the Ulster side struggled to set up scoring chances despite dominating possession for a couple of minutes.